Your company just scored a special project. It’s Friday, and you’ll need 20 workers on hand by Monday. Think again. Gone are the days when a temporary staffing and job-placement agency could fill that request and save the day. Low single-digit unemployment in Tennessee, particularly in a rapidly growing city such as Nashville, means the bodies aren’t sitting in a bullpen waiting to be called up, and the digital revolution means the worker that’s available might not have the skill set necessary to do the job, particularly in the technology sector. It’s a far more sophisticated two-way street these days with agencies finding and fostering talent while at the same time working aggressively with clients to figure out precisely what kind of talent is needed. Nashville, in particular, has drawn attention from both old and new players in the temp industry as an influx of new companies means a steady and rising demand for talent. Now the jobs are more specific, and the talent must be curated, says Joseph Ware, business development manager of Helion Group, which opened in Nashville in July 2018 and focuses on the IT, manufacturing and construction industries. “We work with higher-skill-set positions in a variety of industries around Nashville, and work with both business-development managers and recruiters,” Ware says. “A big part of what we do is consulting. I recently met with a distribution facility in Gallatin that was having a lot of maintenance tech openings. Rather than just putting someone else into that position, we sat down with them to understand their business better and see how that turnover was affecting their operations. That kind of agency-to-business education was new 10 years ago but has become part of the ever-evolving hiring landscape now, notes Brenda Franklin, senior branch manager with Nashville staffing firm Hire Dynamics. “We had to teach them the benefits of working with a staffing partner, but now they really are more engaged and understanding of the value we bring,” Franklin explains. “Our business is more consultative than ever before. If we can get them the right talent more quickly than they can find and onboard it themselves, that minimizes overall costs. And if we are addressing and managing their temporary and even permanent workforce to minimize peaks and valleys, that is cost effective as well. The growth of the staffing-agency role has also meant following companies into hot job markets such as Nashville. In addition to Helion and others that have come to Music City in recent years, LaSalle Network opened an office in the city in 2017. Nashville made sense for the national staffing, recruiting and culture firm based in Chicago because it has the right combination of businesses and talent, says Byron Johnson, director of Nashville operations. A recent survey shows the challenges companies face. • 74 percent of respondents plan to add headcount in 2019, an increase from 65 percent in 2018 and 50 percent in 2017. • 61 percent plan to raise wages in 2019, with a majority (70 percent) stating they plan to raise wages by 0.5 percent to 3 percent. Last year, 48 percent stating they planned to increase wages. • 63 percent of respondents stated it’s difficult or very difficult to find skilled workers. This is the top hiring challenge for 2019, unchanged from last two years. • 67 percent stated it was difficult to find qualified talent in 2018, with soft and hard skills ranking nearly the same in terms of what they struggled most with. • 48 percent stated it’s difficult and very difficult to meet compensation requirements. • 45 percent stated it’s difficult or very difficult to identify diverse candidates. Embedding services like consulting into business operations means that the staffing agency is seen as more of a partner vs. the “on-call” role they have had in the past, notes Greg Dyer, president of Randstad Commercial Staffing. 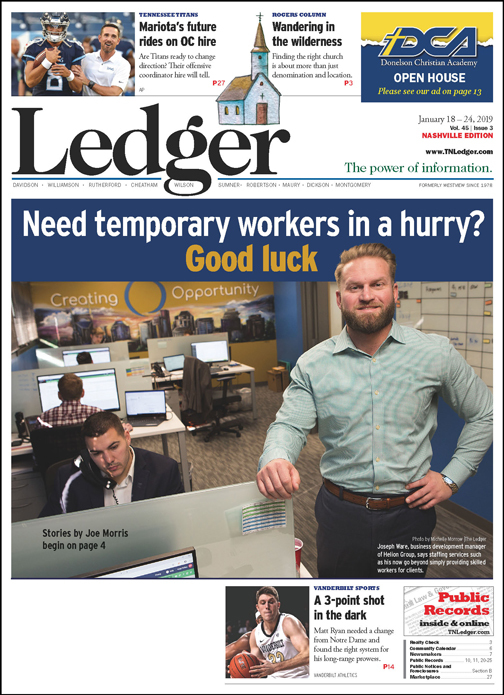 “Today, temp agencies work with clients to help them take a longer-term, more holistic approach to temp hiring instead of trying to fill an immediate need,” Dyer points out. “The best temp agencies of today are in the business of acting as a consultative partner to their clients, helping to guide them through the wage landscape, demographics of the market and more, not just filling job quotas. The workers themselves have been evolving alongside this dynamic of more frequent, targeted engagement. Today’s temp, whether he or she wants to parachute in and out of different gigs or eventually transition to a permanent job, does not greatly resemble their predecessors. “The ‘permanent temp’ is still there, that person who has other things going on and just wants to work here and there,” Franklin acknowledges. “They may not need a comprehensive benefits package, and they have a sharp set of skills that’s always in demand. Every time they finish a contact, they have more experience. Stay-at-home parents or people pursuing a degree are two examples of these workers, Johnson points out, adding that they have very specific needs, and they want those met. “Perma-temp positions are very much desirable, with some people simply wanting the flexibility and exposure that they can get from working ongoing temporary assignments, a really good thing for the gig economy,” Dyer says. Workers, particularly Millennials, have often-lengthy and very specific wish lists for corporate culture and agencies must do the best they can to adhere to those in order to avoid a bad fit, Johnson adds. Even when state and local economies slow, staffing agencies will still need to keep up the consulting profile they have created for new and existing clients, and also keep a deep bench of talent ready to go. That means keeping an eye on trends and continuing to shift as the market demands, Ware predicts. “Some agencies don’t do anything at all, just get any business they can and don’t work to understand the clients’ needs at all,” he says. “We are different, and anyone who wants to succeed is going to have to be different. “You can’t just meet with HR, get a job description and start someone. We go in and really understand that company, which means we don’t go in and immediately look at things as a staffing agency. We need to know what that company is and does first, so when we are talking to talent, we can educate those potential contractors on what they are getting into. Strong familiarity with clients is helpful to agencies as they work to find and keep their stables of talent in competitive employment landscapes. While Nashville remains a white-hot hiring market, Knoxville and Chattanooga also continue to report unemployment numbers in the low single digits. That means agencies are aggressively competing for talent for both temporary and permanent placement, Franklin says. Yes, agencies still do some basic testing, depending on the positions that need filling, and run background checks and other core hiring practices. Now they also have to create a winning and attractive culture for themselves as a workplace. “We have to create a great experience for both sides,” Franklin adds. “From the time a prospective employee calls us to inquire about a job we’ve posted, we have to expedite that call, get them in ASAP and create an experience that is simple and feels good. That is a big part of our culture, and when we do that, we have people who are engaged and excited about the assignments we send them on, and then they tell their friends with the same skill sets we need. “The shelf life of a talented person is about 24 hours — if they come see us and leave without a job, they will go somewhere else. That’s why we are always reworking our ads on social media and updating our website so our name is out there. Temp agencies offer buy-in to health insurance as well as other benefits for contract workers on their roster. The agencies also vet companies to make sure firms offer benefits that temp-to-permanent workers expect. At Randstad, Dyer adds it’s a mix of tech and human touch. “On the tech front, we give candidates the opportunity to leverage technology for the parts of the job search that are more transactional and can be automated,” he explains. “We use things like gamification apps that will assess people’s skills and will use that information to build profiles and interests for our talent, while matching jobs to their skills and abilities. LaSalle also knows it has to work fast to make those connections, Johnson says.